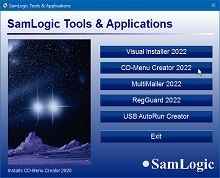 SamLogic - Software for Autoplay / Autorun CD Menu & Setup / Installation & Newsletter / E-mail Marketing etc. Welcome to SamLogic Software's website! Here you will find information about our products. You can order a software online from this site, and download it immediately. We have tools for developers, technicians and marketers. To read more about a specific product, click on a link below. Read the latest news, articles and tips in our blog. With the menu designer tool SamLogic CD-Menu Creator you can create impressive autoplay / autorun menu interfaces for a CD / DVD or USB flash drive in an easy way. From these menu interfaces you can run installation programs, launch applications, show documents, play movies, play Flash animations, open web pages etc. This tool is very useful if you distribute software via a CD, DVD or USB stick. CD-Menu Creator can also be used to distribute product and company presentations, and electronic documentation like PDF and Word files. With the installation software / setup tool SamLogic Visual Installer you can create a setup wizard that install program files, documents, movies or other types of files in your end-users' computers. The setup program can be distributed via CD, DVD, USB flash drive or the Internet. Visual Installer is very easy to use; no programming skills are needed to handle the setup tool. Installations in different languages can be created and striking graphics can be shown during an installation. The tool can create a setup package for your Visual Basic program. Supports 32 & 64 bit Windows. With the newsletter / e-mail marketing software (desktop application) SamLogic MultiMailer you can send personalized e-mails / newsletters to the contacts in your mailing list. The e-mail messages can be in HTML format (containing pictures, sound etc.) or in plain text. MultiMailer can handle e-mail bounces and subscribe / unsubscribe requests from customers. Web forms are included. The program can import contacts from MS Outlook, Excel, Access, Oracle, MySQL etc. Powerful functions for statistics and analysis of e-mail / newsletter campaigns are included. Can I Replace Wise Installer with Visual Installer?